Through my PhD studies, I aim to advance the understanding for marine mercury biogeochemistry. 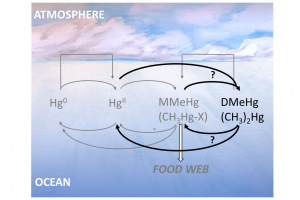 I study formation and degradation pathways of dimethylmercury, a volatile organomercury compound found in ocean water. I want to find out what controls dimethylmercury stability and learn about how it affects the pool of toxic methylated mercury in the oceans, in the present as well as in the future.